There are many locations in center store, shelf/pegged areas, end cap sides, greeting card, cooler/freezer doors, perimeter and check-out poles that are high traffic and high profile locations which both the retailer and CPG brands should capitalize on with creative display solutions that will give the retailer more sales and the shopper more solutions with needed items. We have identified all of these locations and offer many innovative designs that will work great and drive incremental sales. Many of our proprietary display fixtures will give you strong retail retention and have a large impact on the bottom line. Wire displays hang over the top edge of the cooler/freezer door to capture cross-merchandising space. Custom designed to fit your products. Capture new sales in this category with our innovative shepherd hook display fixture that seats onto the acrylic card dividers and hangs our strip peg systems. Increase gift card sales with these displays or cross-merchandise tape, ribbon, scissors and other related party items. Want to capture unused air space in your aisles but cannot find the proper mounting bracket? We have the solution for you. We offer many specialty shelf brackets and can custom-design to your specifications. Throughout the retail store you will notice and easily find dozens, if not hundreds of locations that have vacant vertical steel surfaces. Our magnetic peg strip systems are ideal for high margin and high velocity impulse products. Merchandise off the front of your Hypermax pallet beam with our Pallet Rack bracket. In pegged POG sections, there is an abundance of unused air space. Shea Products developed the Tri-Spinner; a 3-sided system that can offer anywhere from 1-3 to or a dozen different items based upon your promotional strategy. Cross-merchandising products from your snack/chip racks just got a little easier! Whether you need a system to display an informational booklet, hold literature or coloring books, we have the solution for you! These displays will add branded and visual focal points to catch the shoppers attention thereby creating more sales opportunities by utilizing the cubic selling space. Lifestyle imagery can add visual excitement. These displays are custom made to fit your specific marketing strategies. Many shoppers do not purchase kitchen gadgets/tools because the products are only merchandised in the center store P.O.G. 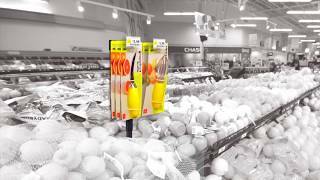 Cross-merchandising the kitchen tools to the produce department and merchandising the ideal tool by the companion produce items can create more sales/consumption of not only the tool but the produce as well. Higher quality tools merchandised in this department have been proven to help boost sales significantly. These displays will add branded and visual focal points to catch the shopper's attention thereby creating more sales opportunities by utilizing the cubic selling space. Lifestyle imagery can add visual excitement. These displays are custom made to fit your specific marketing strategies.